SUPREME COURT nominees should be obliged to give substantive answers to serious questions during their confirmation hearings: I've pressed that argument in columns over the years, on the grounds that senators can't fulfill their constitutional duty to check and balance the judiciary unless they insist on exploring the constitutional philosophy and legal reasoning of the nominees who come before them. Judge Neil Gorsuch testifying before the Senate Judiciary Committee on Tuesday. But senators don't insist. Would-be justices are allowed to get away with fuzzy generalities when asked to discuss the meaning of constitutional texts. When probed on whether contentious cases were rightly decided, nominees retreat to platitudes about "stare decisis" or to banal mush about deciding every case on its merits. However dignified the Judiciary Committee's proceedings, they trivialize the confirmation process by turning it into what University of Chicago law professor Elena Kagan, in a 1995 essay, called "a vapid and hollow charade" — a charade replicated when Kagan herself was nominated to the Supreme Court 15 years later. This week, as Judge Neil Gorsuch appears before the committee, it's being replicated again. In his opening statement on Monday, Gorsuch — graceful, learned, and self-deprecating — described the judiciary the way all Supreme Court hopefuls do. 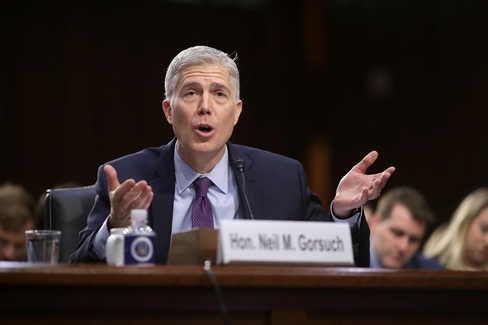 "We sometimes hear judges cynically described as politicians in robes, seeking to enforce their own politics rather than striving to apply the law impartially," Gorsuch said. "If I thought that were true, I'd hang up the robe. . . . Putting on a robe reminds us that it's time to lose our egos and open our minds. It serves, too, as a reminder of the modest station we judges are meant to occupy in a democracy." And, he said, it reminds him that judges must never imagine themselves to be "secret legislators, declaring not what the law is but what they would like it to be." But Supreme Court justices do "legislate." Again and again they render decisions that dramatically shape American law: Upholding segregation. Legalizing abortion. Banning school prayer. Requiring "Miranda" warnings. Disallowing unequal voting districts. Mandating lawyers for the indigent. Nominees coyly deny it, but the Supreme Court is, in effect, a super-legislature, and has been for generations. 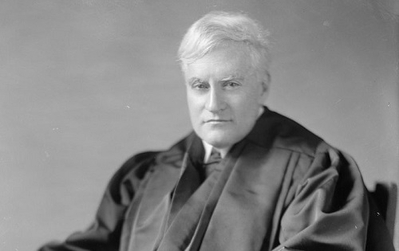 In a famous lecture nearly a century ago, Benjamin Cardozo, then a judge on New York's highest court, described how the judiciary is often expected not just to find the law, but to make it. The judge "legislates . . . between gaps," said Cardozo. "He fills the open spaces in the law." Notwithstanding Gorshuch's disclaimer, to put on the robe of a Supreme Court justice is to occupy not a "modest station" in the American system, but an immensely potent one, one with virtually no accountability, and with life tenure to boot. Before the Senate invests Gorsuch or anyone else with such extraordinary power, it has a duty to explore what he intends to do with it. It never does, though. The politics get in the way. The judge "legislates . . . between gaps," said the great American jurist Benjamin Cardozo nearly 100 years ago. "He fills the open spaces in the law." The Constitution's framers envisioned a judiciary independent of political pressures. Yet from the outset partisan politics have pervaded the courts. The first president to fill the Supreme Court entirely with members of his own party was George Washington; nearly every president since has followed suit. Heated political opposition to Supreme Court nominees isn't new, either. The nomination of Louis Brandeis in 1916 ignited a firestorm of controversy. So did Lyndon Johnson's choice of Abe Fortas for chief justice in 1968. Partisan politics drove the furor over FDR's "court-packing" scheme in 1937. Ted Kennedy's savage attack on Robert Bork 40 years later kept one of the nation's greatest legal minds off the court. Ruth Bader Ginsburg publicly deplored Donald Trump's campaign for president. And every presidential election is routinely described as a crucial battle for control of the Supreme Court. There's no way around it. The Supreme Court is as political an institution as Congress and the presidency. Yes, Gorsuch should be made to give non-evasive answers to serious legal questions, but his fellow Republicans will never jeopardize his confirmation by insisting on it — just as Democrats would never have jeopardized the confirmation of Kagan or Sonia Sotomayor by demanding substantive answers from them. The Supreme Court has never been above politics. Which is why Supreme Court confirmation hearings, alas, are never really about the law.